Quilts made by women incarcerated at Coffee Creek Correctional Facility are on display at the Canby Public Library until April 26th. The exhibit also includes quilts made by instructors in the Coffee Creek Quilters program. 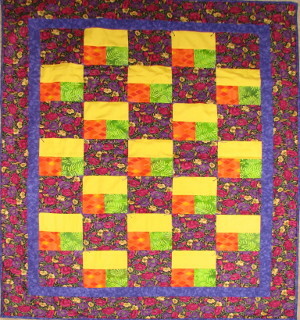 Instructor-made quilts are available for purchase as part of our fundraising efforts. The quilt shown at left is typical of a first quilt made by one of our students. Each student makes three quilts in weekly two-hour classes held in the prison dining room. The Canby library is located at 292 N. Holly, Canby, OR. Please check the Canby Library’s website for their hours. Just enter your email in the form. Coffee Creek Quilters is featured in a video produced by TheQuiltShow.com. We thank them for creating this video about CCQ and granting permission to include it on our website. Please visit our sitemap to see a categorized list of our website pages and blog posts. 2012 © Coffee Creek Quilters. All Rights Reserved. 2012 © Photography by Beth Nakamura. All Rights Reserved.